While in the US Marines Corp, at 21 Patrick Schepeler started drinking at work with his boss. This led to his boss getting fired and Patrick nearly losing everything, including his family. Today, Patrick consults with companies on leadership development and changing company cultures. He refined my leadership style by serving 14 years in the Marine Corps. Patrick Schepeler has experience in the non-profit sector as a Director of Human Resources and in the for-profit sector as a General Manager of a manufacturing facility. He is the founder/author of The Leadership Minute. This is a video and text series that gives daily leadership and self-development advice. Patrick Schepeler has taken this series and is transforming it into a series of books that focus on leadership development for individuals with varying degrees of leadership training. Patrick is an executive coach and corporate training consultant. Patrick analyzes the company culture and turnover rates to develop a management plan using the EPIC leadership method. This method allows him to help companies reduce employee turnover, increase employee engagement and productivity, and save money on yearly turnover. What got you into executive coaching? What is The Leadership Minute? What is the EPIC method and how does it relate to executive coaching? Why is evaluating companies cultures and developing company training important to you? What are some of the common myths about being a good leader? 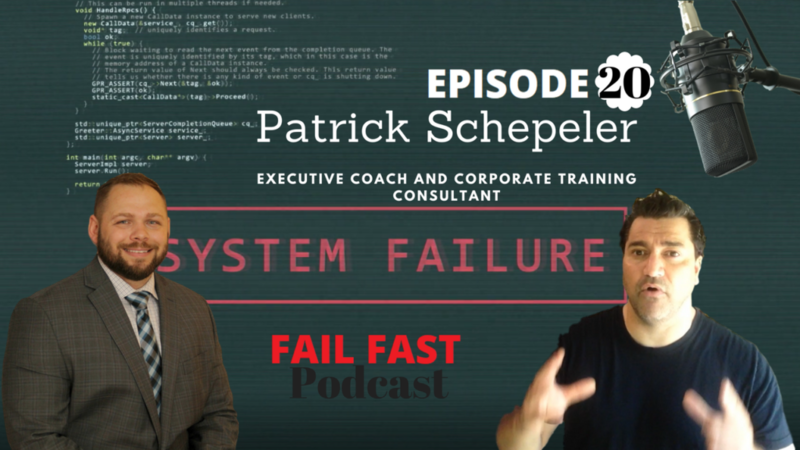 © 2019 Fail Fast Podcast. Built using WordPress and OnePage Express Theme.